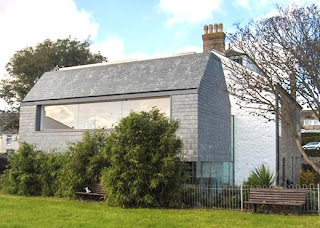 Yesterday I visited the Newlyn Gallery to see the Breon O'Casey retrospective. The exhibition, which has been curated by O'Casey's daughter Duibhne Gough, is one of the best I have seen at Newlyn. If you were only familiar with O'Casey's paintings you could be underwhelmed by his naive style. However this exhibition brings together his paintings, sculptures, jewellery, weaving and prints, and you can only be impressed by the way in which he developed his own lexicon of symbols to produce an astonishing breadth of work. Some of the smaller items are amongst the most exquisite - although this is not easily reflected in photographs. The Breon O'Casey exhibition is on until 28th April - Go along, if you can. There is an informative short booklet accompanying the exhibition by Ruth Golding (cost £10). See also my earlier post about O'Casey and Barbara Hepworth. Lots of stuff here for a taster of the exhibition. I've linked to your post...hope that's OK. I shall certainly be going to the exhibition. I went to Breon O'Casey's evening classes in jewellery way way back... when I was at school in the 60s. Thanks for the good info. Many thanks - I wasn't really aware of Breon until after his death, when Jon Grimble had his work in Westcotts gallery (now sadly closed) but by all accounts he was a great guy. Incidentally, I also used to tune into Charlie Gillett on Radio London in the '70s and enjoyed 'The Sound of the City'. I didn't realise he had died - another sad loss. I'll add your blog to my 'SW blogs' links, if that's ok. Thanks Steve. Very pleased to be added. My engagement ring and wedding band bought on the Kings Road in London in the 60's are still as modern and individual and beautiful as they were when BOC made them. His art lives on and I for one thank him. Cool - His work has a simplicity and timeless quality which few other sculptors and artists can equal.